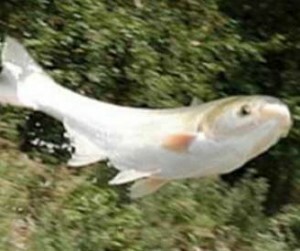 Heavy bodied fish from the family Cyprinidae and can weigh up to 60 pounds. Identified by low-set eyes and an upturned mouth lacking barbels. 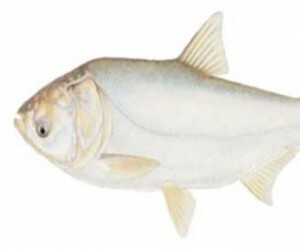 The silver carp looks very similar to another invasive Asian carp, the bighead carp. 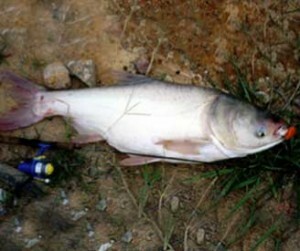 They are freshwater fish preferring to spawn in large rivers with turbid waters. They unusually don’t migrate great distances but migrants have been known to travel great distances in desperation. They can invade many different types of water habitats due to their physiological plasticity, and can consume various food sources. They are found in the Missouri, Loup, Elkhorn and Platte Rivers in Nebraska. They are native to Eastern Asia, Southern Russia, Eastern half of China, and possibly part of Vietnam. They were introduced to the United States in 1973 as an import to stock fish farms in Arkansas. Increase in distribution by accidental escapes. This is a very aggressive fish that can consume up to half their body weight in phytoplankton and detritus. They out-compete native fish populations for resources with their aggressive behaviors and large consumption of plankton. Native species of mussels, larvae fish, and adult fish such as the paddlefish are at greatest risk of being out-competed because of a proven diet overlap. 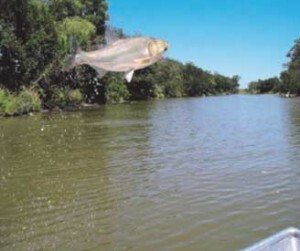 They are known for their ability to jump several feet out of the water when disturbed by boaters. They are a danger to people due to collisions boats of fishermen and injuring people by jumping into them.